Robots in Disguise Combiner Force Warriors Class figures are larger-scale figures that feature classic Transformers conversion and awesome weapon accessories. Change this Warriors Class Windblade figure between robot and jet in 7 steps. Figure comes with 2 sword accessories. 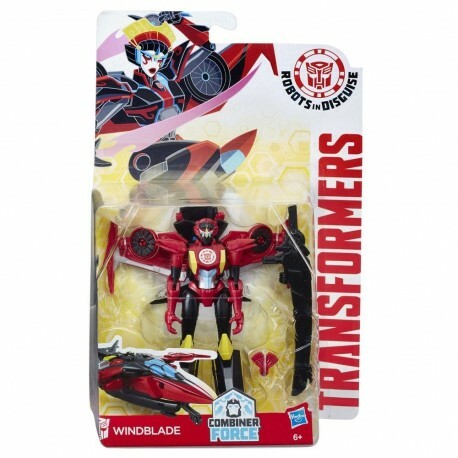 Scan the Autobot shield on this Windblade figure to unlock a token in the mobile app (see below for app details). Windblade moves like fire, swiftly maneuvering around her opponents in battle. In addition to her advanced fighting skills, the Autobot uses her psychic senses to determine the best plan for finding and battling Decepticons. A seasoned warrior and strategic thinker, Windblade is always 1 or 2 steps ahead of most bots. Going airborne in battle, she is a valuable ally to the Autobots. 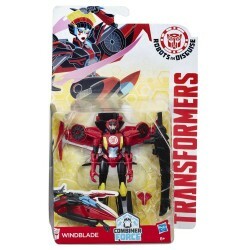 Includes Windblade figure, 2 accessories, and on-box instructions.